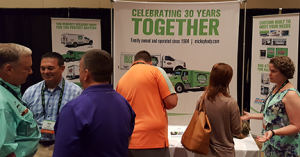 Mickey’s product quality, feature enhancements, customer service and parts availability all received high praise from attendees at the 2016 Interstate Battery Distributor Family Conference & Convention recent held recently in Orlando. Mickey’s Lisa Brunton (right) working with IBS distributors at the Orlando show. Another distributor explained how Mickey accommodated his tight deadline for getting a new unit decaled and delivered. “You guys don’t fool around,” he said.